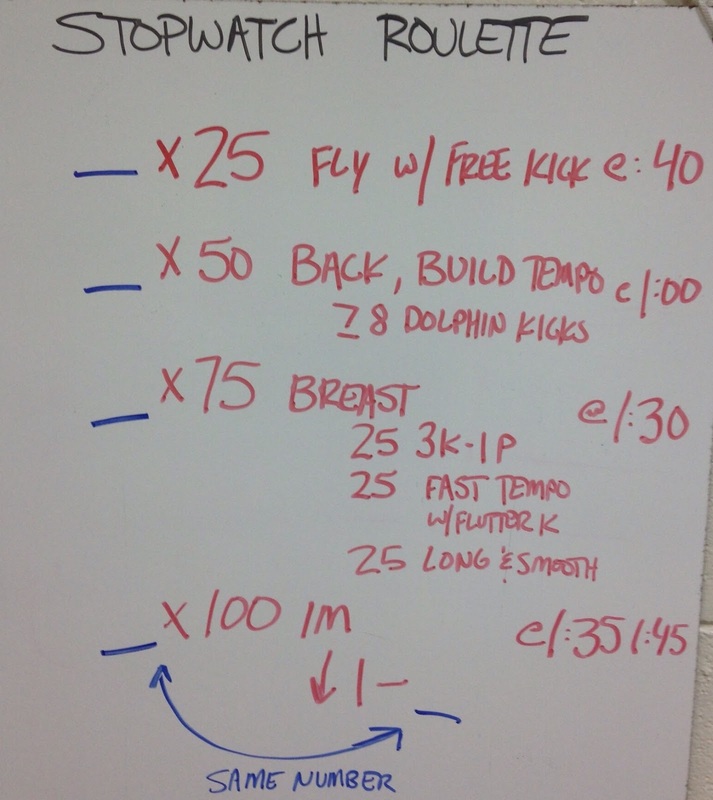 We did this set as a fun twist on our tradition of doing a fly Set today. The secondary goal was to expand their knowledge of times (and encourage them to memorize theirs). One swimmer picked a category and distance. I then asked them for the correct question (this is Jeopardy, remember) to go with my answer. 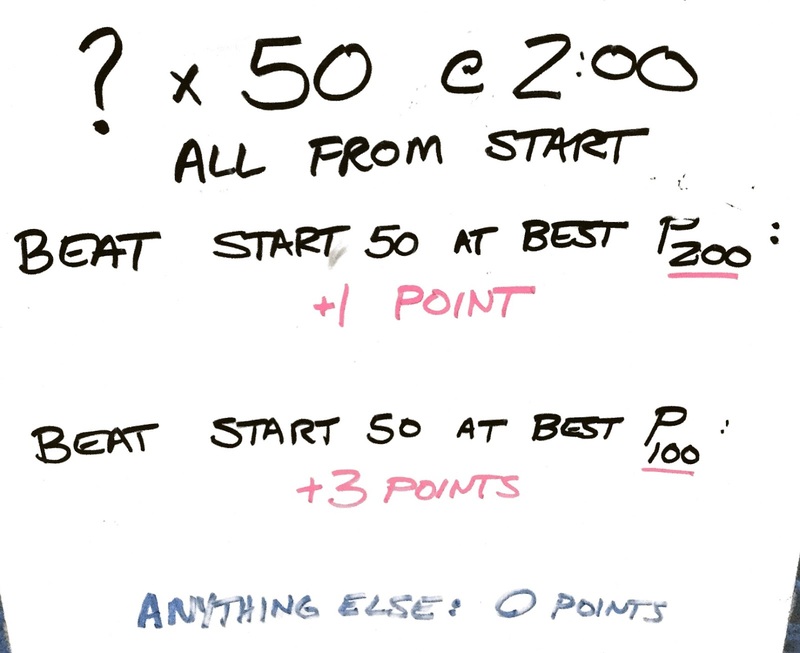 For instance, if a swimmer picked “Your best times (SCY)” for 200, I gave the answer “this is your best time in the SCY 200 IM. 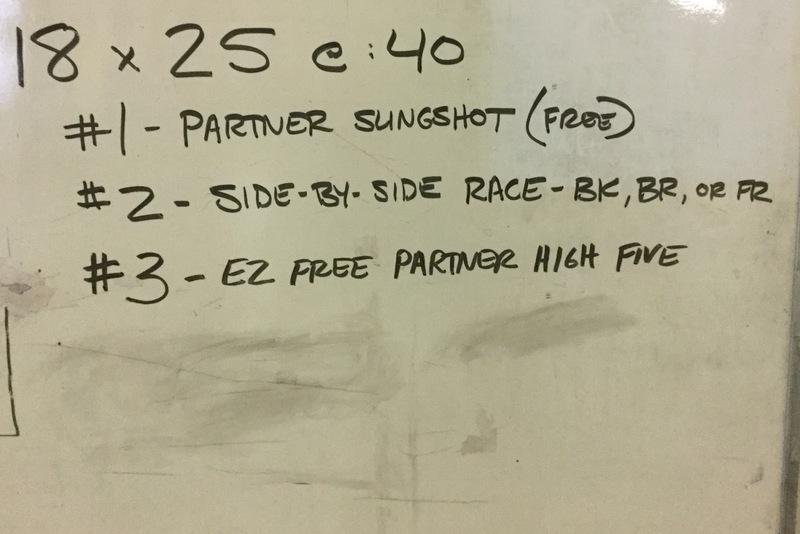 Swimmer would say “What is 2:01.26.” If he was within the range mentioned in the picture above, the group performed the 200 as 50 kick/100 drill/50 swim all fly. If he was incorrect, we did the 200 fly fast for time and a 100 ez free. This picture below shows which swims we ended up doing fast (red X) and which we did as 1/4 kick, 1/2 drill, 1/4 swim. The swimmer who was the contestant selected the member of the group who went next. There are of course tons of variations you could do on this theme. 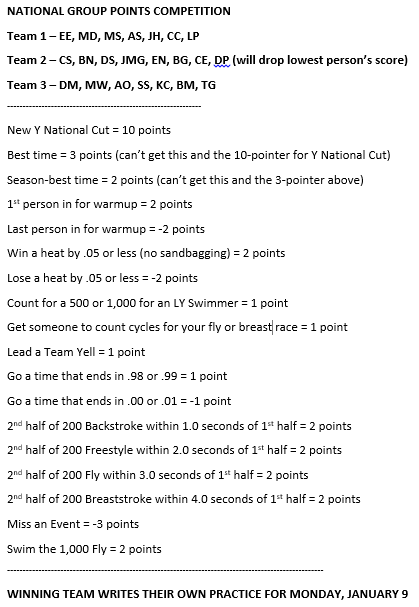 I printed up our best times, team records, and world records ahead of time, but I imagine this could also be fun to do with swimming trivia. At the end of practice, we split our group into two squads, and faced off in a team points competition. We ended up doing eight 50s, and in the last two rounds actually doubled the point values, just to increase the incentive a bit when they were really tired. This is a little set that we finished a long Saturday practice with. In the outline for the workout I gave them before we started, it was called a “fun sprint set.” I think they agreed. Explanation of “partner slingshot” can be found here. To add a little spice to our winter meet, we divided our top group into three teams and instituted the following points competition. Winning team gets to write their own practice for today. They were very into it. In order to keep dryland fun, competitive, and highly interactive, one thing we have done recently is have “Pictionary Dryland.” We divide the group up into 3 teams of 6-8 people, each group with a whiteboard and dry erase marker. I used this Pictionary word generator website for the clues,and show it to one artist from each team. All 3 teams try to solve for the same word simultaneously. The winning team gets the satisfaction of watching the other two teams do a dryland exercise (30 squats, 20 push-ups, etc.) immediately after that round. Continue doing rounds of Pictionary and dryland exercises as long as you want. An extra-awesome thing has started to happen… Sometimes, a few members of the winning team will do the dryland exercise with the losing team. Coach is mighty proud when that happens! My swimmers have recently been obsessed with flipping water bottles. They toss them up in the air, trying to get them to land on the base. We have spent countless hours at meets and even time at practice in between sets trying to successfully flip bottles. Maybe you have seen the video sensation on youtube. So we decided to make it part of a workout. We did a relay. Before each swimmer dove in, someone on his or her team had to successfully execute the water bottle flip. It made for a fun event. Swimmers do fly continuously at first (for an unknown distance). When coach blows whistle, swimmers accelerate to the next wall (still butterfly) and then perform a 50 back at 200 IM race pace. Upon completing that 50, swimmers swim smooth breast until completing the 300. Concept could be used for any IM transition. I like working this fly-back transition because it is the one that is physically hardest to make. The coach can decide whether swimmers will do anywhere from 25 to 225 yards of fly. This is a fun concept for practice you can do any time, but I like to save it for a special occasion. In this case, we did it on New Year’s Eve. I buy a bag of M & Ms, and write a set on the board that corresponds with each color in the bag. 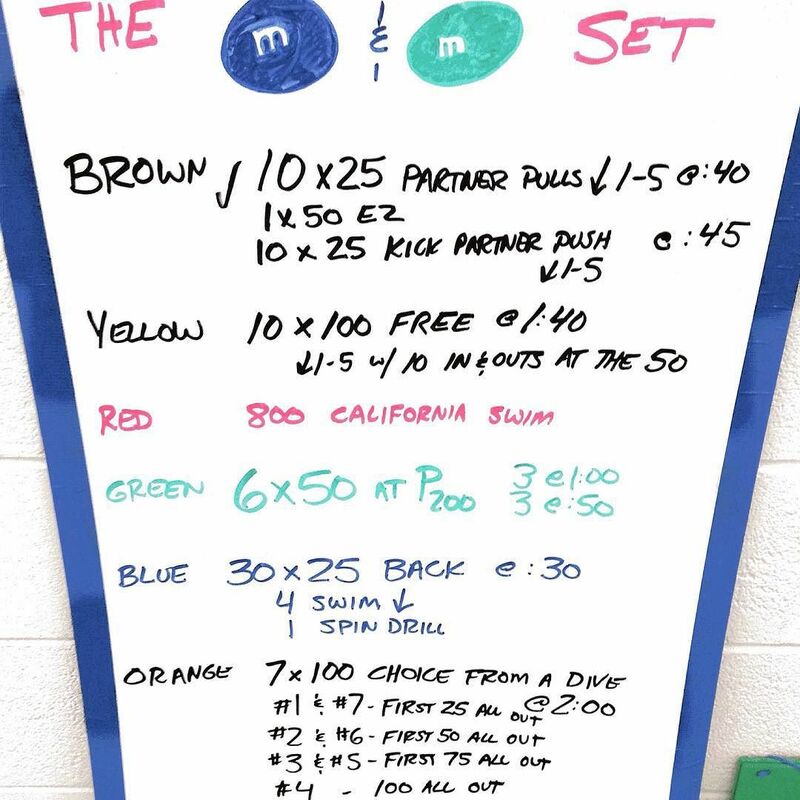 I pick a swimmer to pull an M&M out of the bag (without looking) and then we do that set. 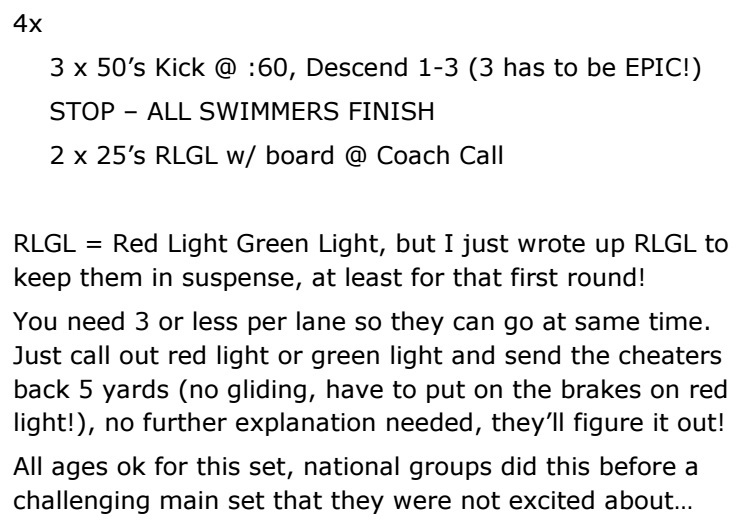 Then, I replace the set with another one in case the same color gets pulled by the next swimmer. The sets can be anything you want, but I like them to be creative, different, or at least something that we don’t do very frequently. Use it as an opportunity to be creative. Do you want to get a group of kids motivated and swimming fast 100s at practice? Try this workout for a psychological test. 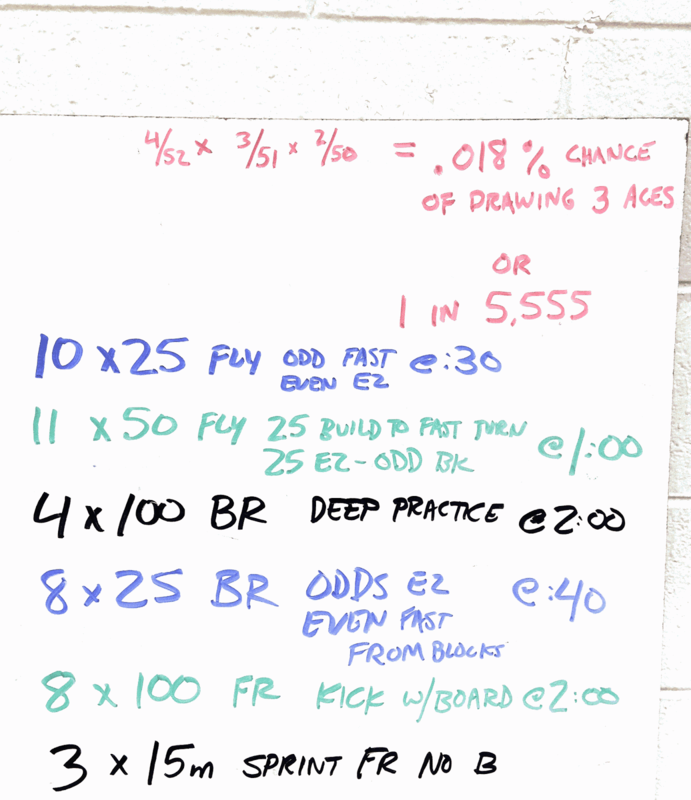 Before practice, the coach writes down a goal time for each swimmer for 100y of one of their prime strokes. The goal time should be extremely challenging (i.e. their lifetime best practice time or maybe even a true lifetime best in some cases). The coach does not reveal the goal times but instead folds it up and pins it to the bulletin board. The group performs fast 100s in groups of three on 4-5 minutes of rest, with ez 200y swims between rounds. For each goal time met, the group receives a point, and the set continues until a group point goal is met. Coach reads the swimmers’ times after each 100 and states whether or not they have reached the goal time, but does not reveal the goal. You will find out how psychologically strong your team is if you set the goals high enough. If they experience some early success scoring points, they will be more motivated. Should they hit a drought, some group members may give less than their best and no longer strive to swim really fast. If this happens, you may reveal the goal times and then give the group a final opportunity to achieve them. Seeing the goal times will help some athletes and others may be discouraged. Regardless of how it shakes out, you are bound to get some fast swimming and some great fodder for discussion about goals (and how hard it is to not have them), expectations, and motivation. If you give the Blind Goal Workout a try, please let me know how it goes. This is a fun idea to try at practice someday just for variety. Write a set that can be done in any quantities like the one below. Start a stopwatch and hand it to a swimmer. 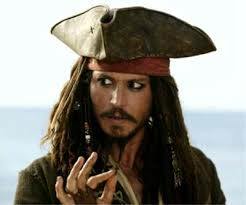 The swimmer stops the watch randomly and whatever digit is in the hundredths place is the quantity for the first part. Repeat for as many times as you need. I call it Accepted or Rejected and we typically do it on a recovery day. I purchased a decision coin on a swim trip several years ago. They have all kinds but this one has “Accepted” written on one side and “Rejected” on the other. It is just as easy to do a regular coin with the words printed on a sticker or just call “heads” accepted and “tails rejected. You need several (say 20) 3 X 5 note cards. You have 2 options either write a set on it yourself or hand it out to the swimmers and they write a set on it. Once a set is written on the cards you shuffle them like a deck of cards (review cards for knucklehead submissions). You then turn over a card and read the set. The coin is flipped. Again 2 options, the coach flips or the swimmers can flip. If the coin lands as “Accepted” the group does the set as written. If the coin lands as “Rejected” the set not done and a new card is turned. Another option we have done is that and “Rejected” set leads to a 100 EZ swim. This set is useful for helping distance freestylers refine a sense of pace. Continue until you achieve 3 points. Swimmers may swim whatever speed they wish. I like to use the Guessing Game during taper, typically at the end of practice. Once a swimmer achieves his three points, he warms down and is done with practice. Tip: Be sure to turn off your pace clock or have the swimmers turn away from the clock when you send them off. 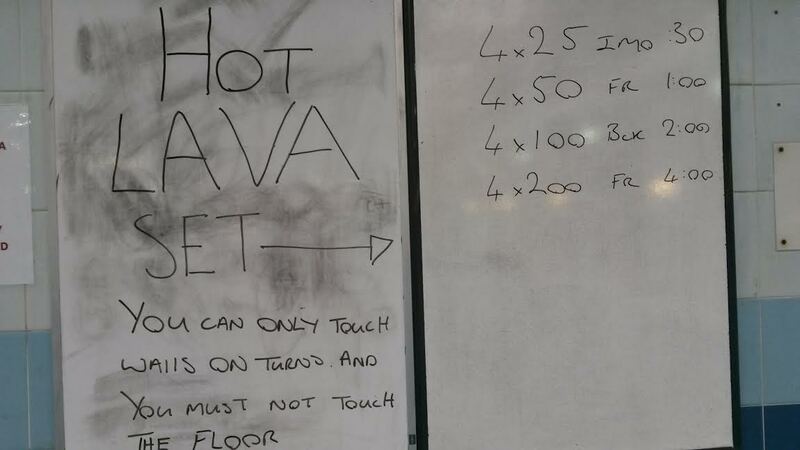 You don’t want them looking at it – there won’t be a pace clock at the meet! This set was originally published here 12/3/2009. Visit our archives for more excellent training sets and ideas. 2. Provides extra resistance to the swimmer’s kicking effort. We performed two rounds and saw many season-best practice swims. The goal of course is to cover the most distance possible. For added motivation, we split up into teams and devised a points system; team with the most total points wins. This set works well with up to six swimmers (two relay teams) in a lane. Divide your group into groups of two or three- try to make even teams to give everyone a good race. Have them race a 1000 (or whatever distance you choose) medley relay. If your teams have three people each, swimmers swim the strokes in regular medley relay order. If you have only two swimmers, leave out one of the strokes. This ensures that swimmers don’t swim the same strokes repeatedly. 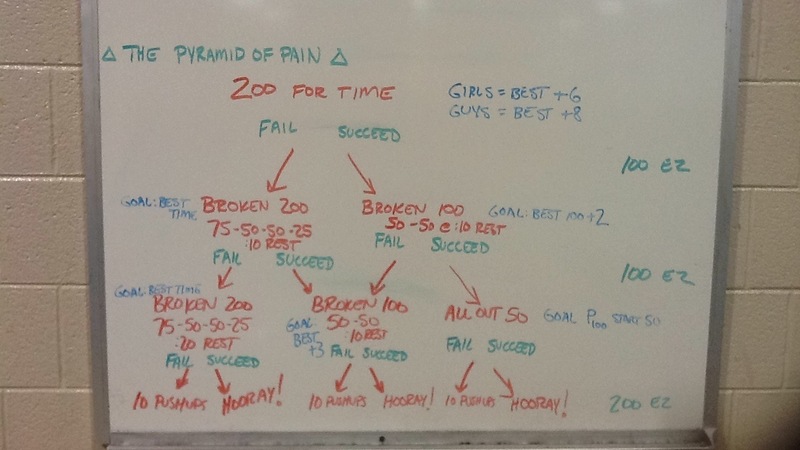 Swimmers complete a single 50 at a time…swimmer 1 does a 50 back, swimmer 2 does a 50 breast, etc. Use the starting blocks for some extra work climbing out of the pool every time, or just stay in the water and go from a push. Can you have a once-in-a-lifetime set to celebrate this once-in-a-lifetime day? – Tell your coach 11 reasons why you liked the set!!! 6 x 50 scramble home relay(swimmers s/l under floating mat then swim to and climb over, best they can, a fitness ball to get to the end). This is a fun set that we do. Or we use it as part of a larger set. Great for getting the kids to push each other and make each other suffer a bit. We call it simply FOWLI which stands for First Out When Last In. No time interval, they just leave based on how fast those around them are swimming. We usually do it as 25’s but you can do it for any length repeat. Generally set up with between 3 and 6 swimmers per lane. The fewer the swimmers the tougher the set. Each swimmer leads between 1 and 4 repeats. The fewer repeats before rotating the lead the tougher the set. After the leader is done they go to the back of the lane, giving them between 6 and 12 seconds extra rest, everyone else moves up one spot shorting them on :02 or so of rest. Some variations that we like: w/ zoomers or fins, pulling, stroke, IM order rotating lead every 4, as a lead in to a set, in the middle of a set, at the end of a set, etc. We like to mix it in to a workout once a week or so. We encourage them to push each other and steal their lane-mates rest. Hope you like it. Let me know if you have any questions. I’ll try to get you some others that we like to do. I really appreciate the site. It has spurred some good conversations and some good thinking on workout ideas. This set was inspired by the scene from Pirates of the Carribbean when the pirates trek across the bottom of the ocean. Thought it would be a good challenge to run across the bottom of the pool. This set is best performed in 6 to 8 feet of water. Have swimmers each grab weights or weight belts (10-20 pounds per person should do) and place them 12.5 yards down the pool. 2) Dive down and pick up your weight from the bottom, holding it and “running” along the bottom of the pool for 12.5 yards to the opposite side, dropping the weight by the wall. 3) Perform 5 press-outs on the pool edge. 5) Pick up your weight from the bottom and “run” it along the bottom back to the middle of the pool. Drop your weight. 6) Push off the bottom and sprint the final 12.5 yards to a perfect finish. Rest and repeat as you wish. This works best in a short course pool and if you have an even number of swimmers. Put half your swimmers at one end and the other half at the other about the same numbers in each lane. When you say “go” one swimmer in each lane will begin. When that swimmer reaches the other side their teammate gives them 5 seconds from when their feet leave the wall and then they push off chasing them down the pool. Their teammate on the other side will do the same for them, then the chaser becomes the chased and so on and so forth. If you get caught as the one being chased or you don’t catch the one you are chasing you have 5 push-ups for each. This keeps going for as long as you would like and you can use any of the strokes. I find it works on a few things; it makes the swimmer work both parts of the 50 it also works on their mental state of chasing someone down or being chased by someone in a race and still pushing through while staying focused on the task at hand. They get more rest between swims depending on how many swimmers you have placed in each lane. Fun but very hard set! The concept for this workout was given to me by Ron “Sticks” Ballatore, head coach of the NCAA Champion 1982 UCLA Bruins men’s swimming team. 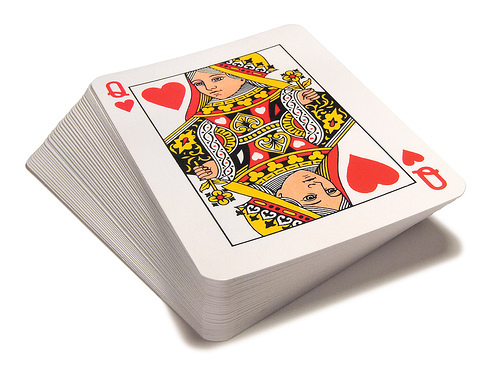 Using a regular deck of 52 cards, have the swimmers take turns drawing a card for the group. Perform the number of reps according to the card drawn. Ace = repeat the reps of the previous card drawn. Thus, a 3 of hearts means everyone performs three pull-ups. A 9 of clubs means 9 pull-ups, 9 pike-ups, and 9 push-ups. Keep going through the deck for as long as you can take it.